Can You give us some advice how to clear the Chakras? How to check are they clear or not? a reply to: JimNasium Sorry about the CAPS. To be honest I don't think my chakras are clear at all. I think they are blocked. i feel as if i have tons of emotions trapped inside that i cant express. ive never been good with opening up, ive kept things from people, done bad things, hurt people emotionally and mentally. and i think im just a complete wreck and the only thing keeping me sane is my child and wife. And ive hurt my wife too (not physically) recently. so i just need a way to detox everything in me. My setting on the other hand is just my apartment. Have a TV no phone and just a 3 month old baby. a reply to: Murgatroid Hard to know whats good/bad nowadays hey, everyone has their own opinion/interpretation of things. It does get easier once you find a reference point. The vast majority of what we have been told is a lie, but the truth is still the truth. Well what happened is during that month-long period I got a letter from an old friend and he told me how he had been born-again, which was a foreign term to me. I didn’t understand, but he described Jesus coming into his heart and how he finally had an encounter with God. I wrote him back and said, “That doesn’t make sense to me.” But the letter just weighed on my mind until one day, as you said, I decided, you know, I’ve got to be open-minded. So I dedicated that whole day to the Lord Jesus and I said I’m not going to do yoga. I’m not going to chant. I’m not going to do any meditation like I’m normally involved in. I’m just going to pray and read the Bible today. And if you really are the Messiah and if you really did come to die on a cross for the sense of humanity, then I believe you’ll show me today. One of the members of the prayer group who happened to be a former yoga student himself, now that doesn't like coincidence, it sounds to me like a God instance. He was walking in a Laundromat and the Holy Spirit fell on him and said, "Don't go in there. I've got a job for you to do. Get in your van and start driving." He had no idea where God was going to lead him. But he started driving and every time he felt an impulse he'd take a turn. He didn't know that two miles away I was standing on the side of the ride hitchhiking. I had been praying all day long from 3:30 in the morning until that afternoon that Jesus would reveal to me if he was the truth. And now I'm going to teach a yoga class. And he never picked up hitchhikers, but he said he felt this compulsion again to pull over the side of the road and pick me up. And when I opened the door and looked in my heart just started leaping inside of me. ...he had taped a picture of Jesus to the ceiling of his van... And that's the first thing I saw when I got in the van. I looked up and there's this picture. So I'm sitting on the edge of my seat in expectation. And a few minutes later, he turned around and said, "Friend, can I ask you a question?" I said yes. He said, "Have you ever experienced Jesus coming into your heart?" I said, "No, but when can I?" And he gave me this surprise look like I wasn't supposed to respond so quick. He said, "You can come to our prayer meeting tonight." I said, "I don't want to wait that long." If I can find Jesus I want to find him now. And so he pulled the van over to the side of the road, left it running, we knelt down in the back of the van, we talked a little while, and then I prayed a simple prayer that I thought was too simple to bring me into contact with God, but it worked. Sid: But it revolutionized his life. In fact, then he goes back to those hundreds of students at the four universities. And what did you tell your yoga students? Mike: Most of my main students became Christians also. And we stopped the classes from that very point. Hello fellow ATS'ers. I was wondering if there was anyone out there willing to teach me how to meditate? ive never done it and when ive tried I just couldn't stop thinking about other things. I couldn't "quiet" my mind, any help or advice would be much appreciated. Hard to find the time to as I work and take care of my 3 month old son. I would recommend watching or listening to a few lectures from Alan Watts, here's a short one. There are many others and some are quite long but I think they are time well spent. I would also recommend the video title the "Art of Meditation" as well if one has the time. It helps if you don't try to accomplish everything in the first go. Meditation isn't a fix it now type of thing. Just set a certain time for you (or time of day say after breakfast, or before waking the kids), and be consistent. Just sit still or whatever position is most relaxing and try not to think about anything in particular. You will not be able to clear your mind at first. Thoughts will come and go, let them but just don't focus on any of them or follow them down the rabbit hole. In time (after several weeks probably) you will begin to notice that you are able to focus more and eventually you will be able to control your thoughts during meditation which is to say not have them. And a focus point is paramount, most people use breathing, I like to use repetitive noises or nature noises. Hope it helps some. Just remember, everyone is different. 6) Alan Props Up the Zeitgeist Theosophical Lie of﻿ Astro-Theology = A Lie (youtube: Astro-Theology Debunked). After being a fan of Alan's for over 2 years, I now see him as a subtle NWO-Theosophist. Yes, in many areas, he's full of great information, pointing out various agenda-revealing writings (penned by even the elites themselves), and yes, he debunks the New Age/Theosophy and exposes Freemasonry- but when it comes to ancient history and religion, some of his assertions just don't add up. In fact, after delving into some of his biggest claims, I began to realize that his views concerning Judaism and Christianity sounded a lot like the Freemasonic/Theosophical version of history. 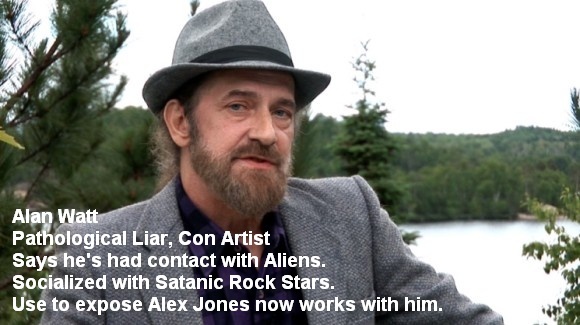 Alan is part of the higher-NWO agenda of finally dismantling all of the religions. So here are the 6 major mistakes that first alerted me to Alan's theosophical leanings. 1) The ancient Israelites never existed prior to the Babylonian dispersal into Judea around 400 B.C; & the language Hebrew is not ancient but rather a later addition via the A.D's = lies. 2) The entire Old T. was originally written in Egypt in Greek as 'the Septuagint' by 72 Mystery School priests around 280 B.C = a lie. 3) 'Israel' = 'Isis Ra El': Alan maintains this theosophical word-trick (so does Jordan Maxwell) = a lie (I'll show other word-tricks that Alan proffers in the hopes of connecting the Bible to the Mystery Religion, and how he twists the meanings of words and loves playing the o' theosophical trick of inverting Yahweh with Satan (something Freemasonry/Theosophy loves doing (i.e. Pike, Blavatsky, Bailey)). kind of massive planetary catastrophe in ancient times). 5) Alan attacks Christianity as something completely created by the Mystery Schools, and not high-jacked. He says 5 key things: 1) At the Council of Nicea in 325 AD, Constantine hammered out Christian dogma; and the early Church Fathers drew upon pagan elements when constructing Christianity 2) the Bible has been rewritten and tampered with many times; and hundreds of books were left out of it 3) Christianity was made-up by the Mystery Religion/Roman-elite-families as a way to better enslave the masses; 4) Paul never existed 5) Christianity was really a form of Gnosticism. = all lies. 6) Alan props up the 'Zeitgeist-astro-theological-lie', which attempts to link Christianity/the New T. to the movements of the Sun & the Constellations = a lie. For several months Alan Watt has been making threats against members of my forum, and on January 6th, he named me personally, and said he would be sending the cops after me. He has continually lied and distorted reality, and after recently having been exposed for plagiarizing the work of a man named Glen Kealey, he is reaching into new depths of bizarre desperation, claiming that I am the leader of a mob that is threatening his life and that of his dog, and that the cops are coming for me. I hope that this account helps those fans of Alan Watt, many of which were probably confused by his recent behavior, to put things together, and begin to snap out of the haze he has lolled you into. We will each have to break the spell that the “leaders” of this movement have cast on us if we wish stand a real chance at changing the future. We simply cannot afford to let ourselves be diverted by men with agendas that we do not even fully understand. Alan Watt is the final gatekeeper. If we can steer past him, we are in the clear, capable of deciding our own path. Since I found the source of Alan Watt’s material, his books and basic ideas I haven’t listened to any more Alan Watt. I was growing weary as he promised to be giving us streaming consciousness and he now reads scripts. Mostly reading articles posted by others and written by others which it turns out is his modus op, using other people’s work. Glen Kealey is the true source of Alan Watt. I also think Glen Kealey is the source of Lenny Bloom and David Icke, IMHO. I noticed Lenny Bloom website is down and its most likely because his sculpter image is lifted from Glen Kealey along with his tag line of “scrapping the bull# off the truth” is a variation of Glen Kealey’s tag line as is Alan Watt’s tag line also lifted from Glen Kealey. David Icke of course is another preverted disinfo distraction designed to cover up the real facts presented by Glen Kealey. Meditate on physical sensation combined with breathing techniques and your mind will slip into the gap where thoughts are like waves of images rather than mind chatter.